The EuroFIR eBASIS (Bioactive Substances in Food Information Systems) is a unique Internet deployed food composition and biological effects database for plant-based bioactive compounds with putative health benefits. Over 300 major European plant foods are listed and information on 17 compound classes (e.g. phytosterols, polyphenols, glucosinolates and lignans) is provided covering multiple bioactive compound classes and plant foods, with data sourced from peer-reviewed literature. A standardised approach to quality assurance of literature searching, data evaluation and reporting has been incorporated throughout the design, construction and delivery of the database. The quality assurance systems in EuroFIR eBASIS are supported by standard operating procedures (SOPs) and full documentation of decisions and procedures. The implementation of SOPs ensures the quality of each step of the compilation process from reference collection to final data point. Data reporting from EuroFIR eBASIS uses a sophisticated data retrieval software system, searchable by compound, food or biological effect, allowing users full control over the data selected for output. Outputs can be downloaded as spreadsheets, allowing the user to perform calculations, create graphs and manage the data as required. The database represents a unique comprehensive resource on bioactive compounds for researchers, health professionals, health educators, the food industry and policy makers. The eBASIS system has its origins in composition databases developed in the 1990s covering quality assessed peer reviewed data　on natural toxicants in food plants namely NOTIS (Naturally Occurring Toxicant Information System) developed at the Institute of Food Research (IFR) in Norwich, and TOXIP (Naturally Occurring Toxicants in Food Plants) developed by the Danish Veterinary and Food Administration (DVFA), Copenhagen, Denmark. These two CD version databases were merged using the structure and organisation developed in the EU NETTOX project to produce the first BASIS (Bioactive Substances in Food Information System) database, funded as a Concerted Action under the EU FAIR programme (CT98-4419) from 1999 to 2001. The BASIS database extended the range of compounds covered, and the NETTOX list of food plants most commonly consumed in Europe was included. The aim was to gather data on all these food plants and, for the first time, to include compounds with beneficial health effects, as well as potential toxicants. 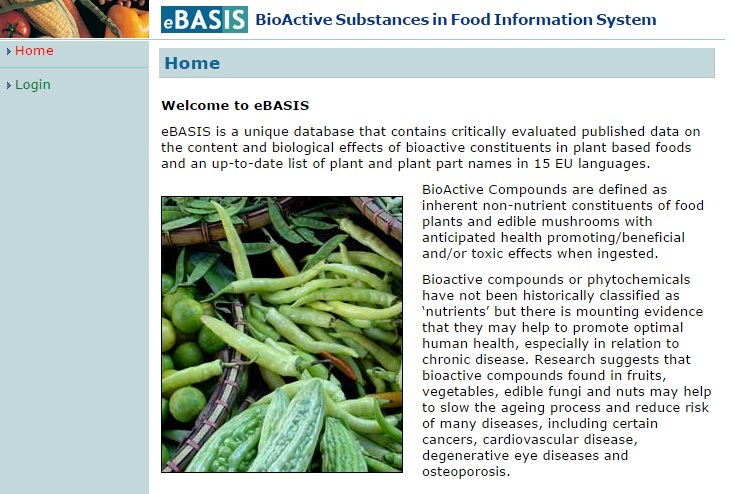 The eBASIS database was further developed by IFR, University College Cork (UCC), Danish Technical University (DTU; formerly DVFA) and Danish Food Information into EuroFIR-BASIS with funding from EuroFIR NoE (FP6, 2005-10), and supported by other experts by combining compositional and biological information on potential protective bioactive compounds using information from published papers and similar critical assessment quality systems based on an internet-deployed rather than CD format. EuroFIR-BASIS was designed to be compatible with the format, structure and organisation of the national nutrient composition databases, as well as common food description systems, such as LanguaL, the international framework for food description, to ensure that similar search terms could be used to search and retrieve information from both nutrients and bioactives from all databases. The current eBASIS database has composition and bioeffects (both beneficial and toxicity) information on over 300 major European plant foods supported by data on 24 compound classes covering approximately 200 beneficial and 90 toxic bioactive compounds, such as glucosinolates, phytosterols, polyphenols, isoflavones, glycoalkaloids and xanthine alkaloids. How do I access eBASIS? Access to eBASIS is by individual user name log in only. If you are interested in viewing the database please contact our Secretariat at secretariat@eurofir.org. What is the origin of the plant list used? The plants included in eBASIS are the 300 most commonly eaten food plants in Europe. Who should I contact with problems/bugs/queries? Is there a user guide for eBASIS? I have some data I would like to add can I do that? Data included in eBASIS has been peer-reviewed and published. If you have found areas where information is lacking please let us know. If you would like to contribute for data entry, please contact us. How up to date is eBASIS? eBASIS is a growing online repository of critically-evaluated research information on food plant composition and biological effects comprising currently 40,000 entries from over 1500 publications. The 300 plant foods included are both comprehensive and representative of those produced and/ or marketed in the different geographical areas of the UK/EU, described in 15 European languages. As is the nature of databases there is a constant need to update, updating is in progress but some compound classes cannot be considered complete. Users come from regulators, academia and industry in Europe and globally. It is envisaged that primary users of eBASIS will be the regulatory affairs sector (e.g. assessment of genetically modified plants/novel food plants, supporting health claims/risk assessment), food industry (e.g. evaluation and development of novel foods) and researchers and epidemiologists. Can eBASIS be used to determine health claims? eBASIS has a highly flexible reporting system that allows users to control what data are extracted and what information is displayed. The data are used to assess whether a component has been reported to have beneficial health effects and the nature of these benefits as well as quantifying levels at which any health benefits may be exerted. Such information is essential to support or refute health claims as well as develop new functional foods. The large numbers of health claims received by EFSA, relating to plant-based bioactive compounds included in eBASIS, suggests it is a useful tool for evaluators to determine independently not only the completeness of health claim dossiers but also their validity. Conversely, eBASIS has potential for claimants compiling such dossiers. What is the quality of data on eBASIS? eBASIS data are fully documented and the origin of individual data points can be traced back to the original publications. All the processes that are associated with the extraction, evaluation and inputting of data are performed within a BASIS Quality System that ensures adherence to international quality standards (ISO and ILAC systems) and is guided by a fitness for purpose approach. Is the database being expanded? What do eBASIS and the Phenol-Explorer databases have in common? Both databases contain quality assessed composition data on polyphenols, however eBASIS covers additional compound classes present in plant foods such as the glucosinolates, phytosterols and capsaicins. Although Phenol-explorer does provide pharmokinetic data on metabolites, which eBASIS does not have, what sets BASIS apart from other composition databases is that it includes quality evaluated beneficial bioeffects information from peer reviewed publications, this includes the bioeffects of compounds/plants on different biomarkers in human studies, for example effects on BP, haemostatic function, lipid profiles and hormones.